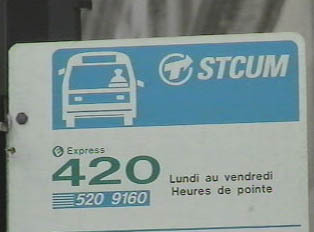 Buses in Montreal and other large Canadian cities run frequently from early morning until late at night, running later on weekends, with slightly less frequency during the day. For commuters, there is an efficient system of express buses that uses lanes set apart from the usual rush hour traffic. When taking the bus, one needs exact change. If a passenger either needs a transfer, or will be returning home within a period of, say, three hours, it is possible to get a transfer with the time stamped on it. The transfer will be valid for passage on any bus taken within the city, before the time expires. It is possible to buy bus tickets in packets of six, or a monthly pass, which is good for travel on any city bus. Bus schedules change with each season. At that time, bus schedules are left on the buses for passengers to take – it is good to get them as soon as they come out. The main buses all stop at the subway stations, and schedules are usually available there, as well. The largest cities in Canada have efficient subway systems, which, in conjunction with the buses, can be used to get just about anywhere. In Montreal, tickets are for sale individually or in packets of six at the booth in the metro station. One can also purchase a monthly pass. For the passenger who needs to transfer to a bus, there is a machine just after the turnstile where a transfer will be issued. This transfer will be usable on any bus within a period of approximately three hours. It will not be valid, however, for any further subway rides. "What Line Do I Take to Get to Bonaventure Place?" "What Train Do I Take to Get to the Saint Michel Station?"